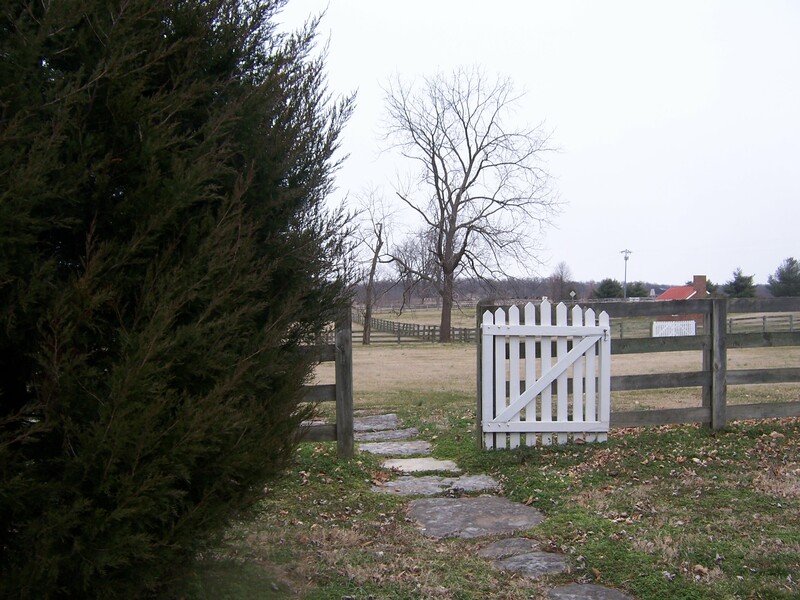 An open gate at South Union Shaker Village. As I headed south through Kentucky, the snow disappeared and the sun played hide and seek with the clouds. Even without the snow it was still cold and blustery as I got off I-65 and turned west on US 68/State Route 80. I had been on this stretch of road back in August, when I had accompanied John on a trip to Cave City, KY and made a quick side jaunt to visit my mother. The drive is a pretty one, on a good road that passes through rolling farmland and never seems to be heavily traveled. I had noted signs for another Shaker Village on that trip, and that’s where I was headed now. In the early 1800s this part of the country was a hotbed of religious activity. The Second Great Awakening, a Protestant revival movement, sent evangelical ministers into newly settled regions to enroll new members via camp meetings. Lucy Wright, leader of the Shakers at the time, sent her missionaries to proselytize in Vermont, New York, Ohio, and Kentucky, and it was at this time that several Shaker communities were established. 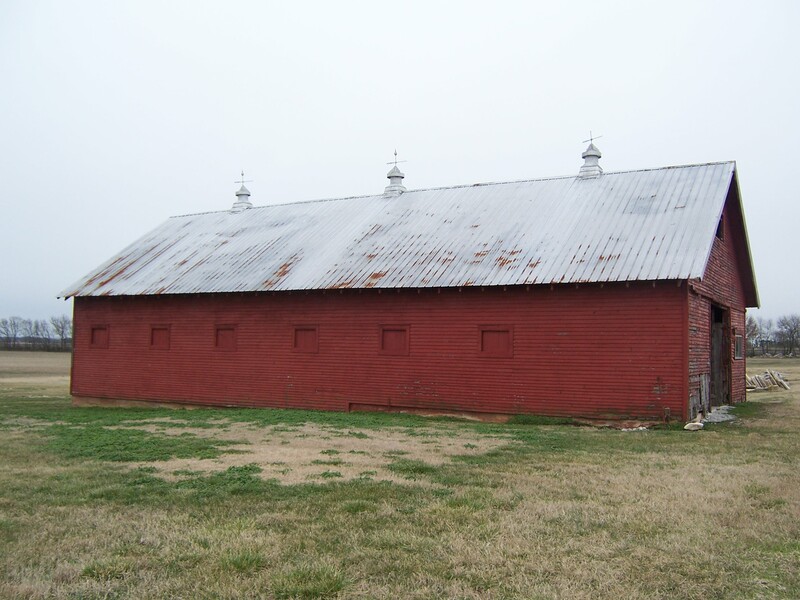 The Pleasant Hill settlement was one, and another was located at South Union, in Logan County. Like Pleasant Hill, the Shaker community at South Union thrived during the pre-Civil War era and produced furniture, textiles and farm implements and was part of the birth of the seed industry in the area. And like Pleasant Hill, South Union also suffered economic setbacks after the war, resulting in a decrease in membership. (Remember, these folks practiced celibacy, so new members had to come from the outside, rather than being born into the faith.) The South Union community last a few years longer than Pleasant Hill, with its remaining members selling off the settlement’s worldly goods and property at public auction and closing its doors in 1922. Restoration of this site began in 1971. The South Union site sits about a mile off the main road and consists of five buildings on approximately 500 acres of land. There’s a small visitor center with a gravel parking lot, and that’s where I headed first. The nice young man running the visitors center gave me a dollar off the $8.00 admission fee since I’d visited Pleasant Hill – even though the two organizations aren’t connected. There were no tours that day and I had the place all to myself, but he told me the main building, which houses a museum and gift shop, was open, and that I was free to walk around as I pleased. I bundled up in my gloves and parka and fleece headband and struck off across a nearby field to visit the Shaker Grain Barn. It was wide open and felt just a little eerie; the wind was gusting and making all the loose bits creak and groan. I explored it a little: went up some staircases that were roped off at the top and it would have been easy just to step over the ropes to explore further – but it was just too creepy. In fact, the whole area seemed a bit creepy – maybe it was because I was by myself, or because the wind was blowing so hard or because I keep seeing starling murmurations overhead (I took some videos of my own but they didn’t come out very well). I decided to walk further out into the fields, and that’s when I came upon the Shaker cemetery. 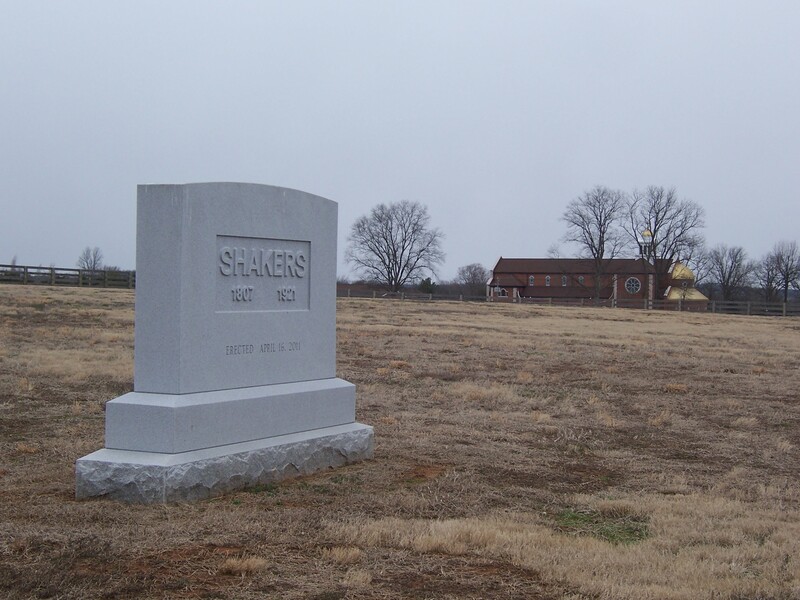 When the few remaining Shakers sold out and left the area in 1922, they left behind a sizeable graveyard with some 425 people buried there. Some of the graves were marked with stone markers, and others with iron “lollipop” markers. A Louisville businessman bought much of the Shaker property, including the burial ground. So what did he do with it? He took down the fence around it, pulled up the stone markers and had them ground up and used to lime the fields. Apparently he also had the iron lollipop markers simply plowed under, because the restoration folks have founds shards of them by the bucketful. The cemetery was built upon and cultivated, and for the longest time no one was exactly certain where the graves were. Eventually a grant allowed the non-profit which runs the site to bring in ground-penetrating radar, and the gravesites were finally located. The Shaker cemetery, with the nearby Fathers of Mercy complex in the background. Now the cemetery has a fence again, and a single monolithic stone marker serves as a memorial to all the Shakers who rest there. It’s a sobering sight, and with the starlings whirring and wheeling overhead, a little melancholy as well. I made my way over to the village’s Center House, which houses the museum. It’s an imposing brick building but it smelled wonderful when I walked in: warm and scented with coffee and baked goods. That’s because the gift shop is located on the bottom floor. I decided to save that until last and worked my way up through the museum. It’s beautifully laid out and the exhibits are fascinating. There’s a whole section dedicated to the cemetery, with a case full of those shattered iron lollipop grave markers that have been painstakingly pieced together, along with supporting documents from the settlements’ papers – so much so that the former residents came alive as I read their histories. I was also startled at the amount of artifacts and furniture on display that was ORIGINAL to the site (most of the furniture at Pleasant Hill seemed to be reproduction). Apparently the local folks that came to the South Union auction back in ’22 cherished their Shaker purchases and were kind enough to return pieces when restoration of the site began. View out the window of the Center House. After I’d spent an hour or so in the museum, I went downstairs to the gift shop. The prices seemed far more reasonable than at Pleasant Hill, and I bought some soaps and tea and herb mixtures, the latter from Sabbathday Lake in Maine, the last active Shaker community in the United States. I also bought an unusual “turkey wing” whisk broom to use on my potting bench, which turned out to have been made by the young man running the visitors center (he stopped in to help the lady in the gift store with a computer issue). He told me he had taught himself how to make them by studying pictures, and invited me to stop back by the visitors center to see some hawk-wing whisks he’d been working on.